With a retail price of $200, the Versa is much easier to justify for long-time Fitbit users as well as those interested in a smartwatch that won't break the bank. It excels at fitness tracking, and the battery life is fantastic. The Versa is also one of the most comfortable smartwatches I've worn. 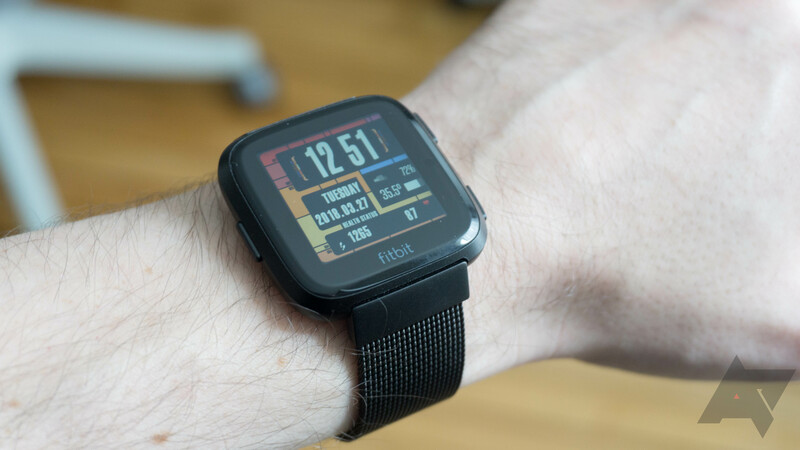 Fitbit has done a surprisingly good job of getting developers to make things for its watches as well. However, performance is still middling, and the software can be sluggish at times. Design Very light and comfortable with an aluminum case. Fitness tracking Best-in-class tracking of steps, workouts, and sleep. Display Sufficiently sharp and very, very bright at 1,000 nits. Protection Water-resistant down to 50 meters. Battery life This watch just keeps going—getting four days on a charge is totally doable. The charging dock is nice, as well. Media controls You can control music on your watch or a connected phone. Connection The Versa seems to lose connection to my phone randomly for an hour or two at a time. Software and performance The watch software can be sluggish. No button customization and no always-on display option. GPS The Versa doesn't have it. Voice commands Again, the Versa doesn't have it. Notifications It syncs notifications, but they're of little use. Fitbit Pay NFC payments are only available on the special edition watch. 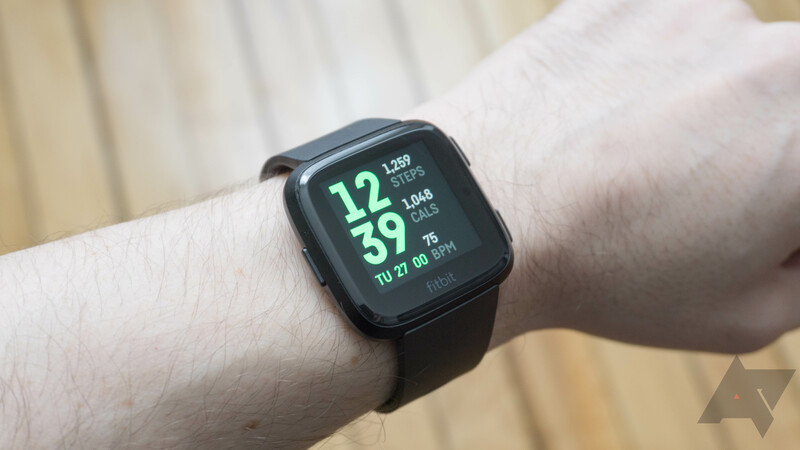 The Fitbit Versa is a much more compact and understated device than the Ionic. It's a small square (39x37mm) with rounded corners and chamfered edges. 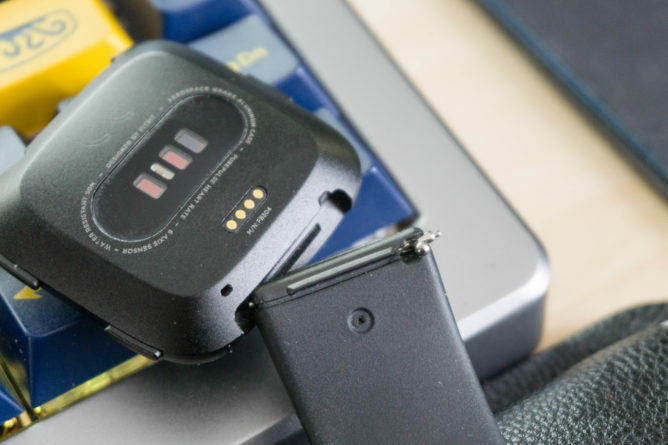 The bands connect directly to the body without external lugs, and they're angled downward. This helps keep the watch close to your wrist and improves the fit. 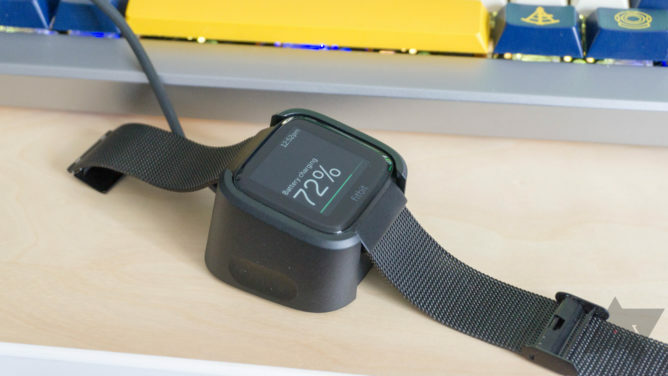 From a distance, the Versa looks very much like an Apple Watch, but not as much when you see it up close with the display on. The bezels are larger, and there's a subtle Fitbit logo below the screen. The bottom of the Versa tapers more gently than the Ionic, and the optical heart rate sensor is right in the middle. Next to that are the charging pogo pins, which I'll get to later. You won't see a speaker or a microphone. You cannot take calls or issue voice commands to your phone via the Versa. That won't come as a surprise to anyone familiar with the Ionic. The Versa has a 1.3-inch LCD with a resolution of 300x300. This is an improvement over the Ionic because the display is square instead of rectangular (the pixel count works out to be similar). Watch faces and apps look less cramped on this display. The LCD is plenty sharp, and it gets ridiculously bright (Fitbit claims 1,000 nits) for easy outdoor viewing. There's an ambient light sensor in the watch to control the brightness, so you don't have to adjust it manually. There are three buttons on the edges of the Versa: one on the left and two on the right. There's very little play with any of them, and they have good tactile feedback when pressed (I'll get to all the functionality later). Fitbit is still using an aluminum case that doesn't feel particularly like aluminum. I'm not sure what sort of treatment it uses, but the metal feels strange. That said, the Versa is a solid little watch; it's water-resistant to 50 meters and very light. Combined with the smart band design, this is probably the most comfortable smartwatch I've ever worn. A quick note about the bands: while it looks like a standard connector, it's not. 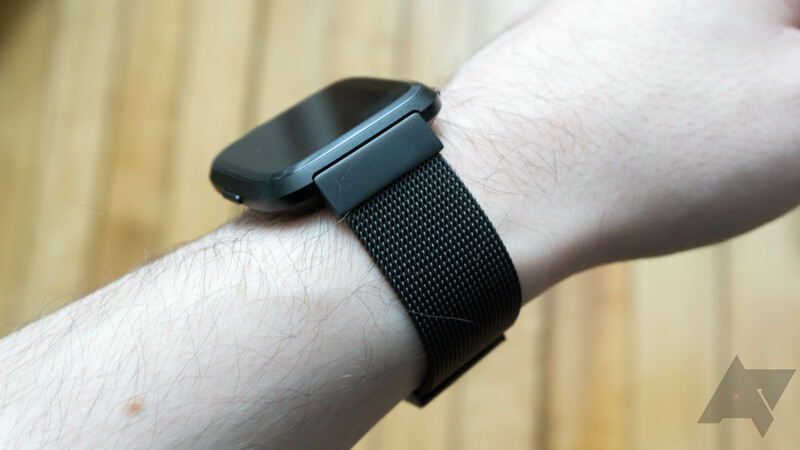 Fitbit is using a spring pin system on the Versa (the Ionic had a completely different clip design), but the case doesn't have enough clearance for most third-party bands to fit. Fitbit's own bands come in silicone, metal link, metal mesh, and leather versions. 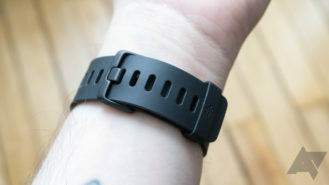 The watch includes small and large silicone bands, and they're the lightest options. I like the way the loop plugs into the band to hold the extra length down, and they feel durable. Fitbit's other bands look and feel nicer, but they're very expensive. Paying $100 for a metal link band is insane when the watch is only $200. Third-party options will come later. This watch lacks GPS and NFC, but there's a special edition watch for $30 more that comes with NFC for Fitbit Pay. That version also has a fabric band that you can't get separately. I haven't seen it in person, but it looks really cool in photos. For GPS recording of your runs, you'll need a connected smartphone. Fitbit sees its smartwatches as fitness-oriented first and foremost. Many of its features are based around exercise, and the Fitbit app puts your health stats front and center. A lot of what the Versa does is entirely automated. When you put it on, it begins tracking your heart rate and logs it to the app. After a couple of hours, the watch has a good handle on your average resting heart rate. It'll also track steps automatically. To check your daily stats, just swipe up from the bottom of the display to get the "Today" interface (see below). If you hit the gym, the watch also knows to log your workouts. I don't like that automatic workouts aren't shown on the watch anyplace—you just have to trust that the watch will record it correctly. In fairness, it always has during my testing. You can also start workouts manually via the top right button. The Versa has modes for running, biking, swimming, and more. Fitbit's software updates have made manual workouts less awkward to start and stop than they were on the Ionic, but it's still a bit slow. One of the main selling points with the Versa (as with the Ionic) is that your data is logged to the Fitbit app. It compares favorably to other fitness tracking apps with a good dashboard screen and plenty of handy graphs to track your activity. 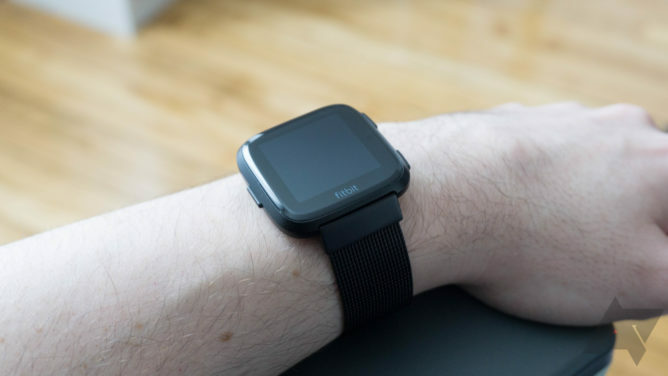 The Ionic was finicky with exercise tracking, but I couldn't get sleep tracking to work at all. I'm pleased the Versa doesn't have any such issue. It's also light enough that it's not uncomfortable to wear at night. It monitors your heart rate and how much you move to estimate when you're sleeping deeply, awake, and in REM sleep. I don't know how accurate it is, but it's at least plausible. The Versa is based on the same platform as the Ionic, just with a few components removed from the board. I wasn't impressed with the Ionic's performance, and it's still a problem with the Versa. It's fast enough waking up when you lift your wrist, and swiping through the app list isn't bad. However, most other actions are laggy to the point they can seem broken. For example, if you swipe up to access the Today interface, you'll probably see a black screen for about two seconds while the watch catches up. There's also a substantial delay when you swipe down for notifications. Scrolling through the notifications? That's even slower. Often times, the Fitbit Versa feels like a fitness tracker that's trying to act like a smartwatch. The Versa might not have a lot of horsepower, but it's class-leading when it comes to longevity. 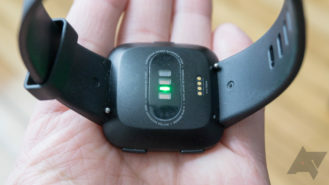 Fitbit says the Versa can last four days on a charge, and I think for once a manufacturer battery life claim is right. This watch gets incredible battery life, even with always-on syncing and heart rate tracking enabled. There's no option to keep the display on except during manual workouts, though. That probably saves a ton of juice. Thankfully, Fitbit opted to include a charging dock for the Versa—I hated the magnetic cable that came with the Ionic. The Versa's dock has clips on the side that you squeeze to open it up, then you drop the watch in. The clips hold it in place so the pogo pins remain in contact with the dock. The dock isn't very heavy, so the stock band tends to lift it up slightly from the surface, but it's still better than the cable. I don't like the dock as much as Samsung's wireless charging stands. It's better than most smartwatch chargers, though. 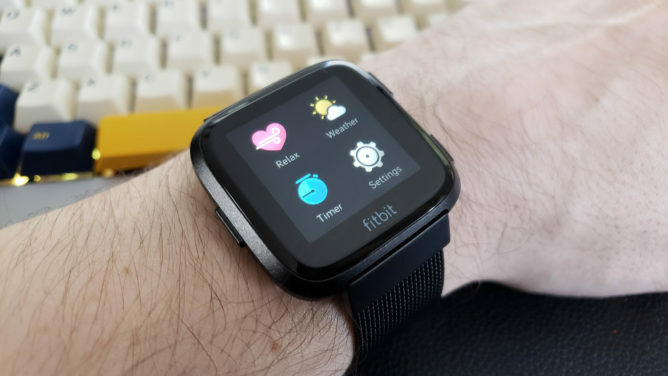 The Fitbit Versa runs the same Fitbit proprietary OS as the Ionic, and thanks to a recent Ionic update, they work exactly the same. There have been some changes since I reviewed the Ionic, and it's mostly for the better. The functionality of the hardware buttons has changed, and they make much more sense. The left button goes back a screen or returns to the watch face depending on where you are. A long-press of that button always launches the quick settings UI where you can access a notification and screen toggle, as well as media controls (more on that in a minute). The top right button launches manual workout mode. The bottom right button now opens your alarms. I do wish you could customize these buttons, but at least this layout makes more sense. There is also no always-on display mode unless you're doing one of the watch's integrated workout programs. You can cache music on the watch (it has 2.5GB of storage reserved for tunes) via Pandora or Deezer. Your personal music files can also be loaded, but you have to use a computer. Pairing a Bluetooth headset with the watch means you can listen to music without your phone. That works well enough, but the new Fitbit software also finally supports playback controls for your phone. The setup for this is somewhat tedious—you need to pair the watch in "classic" mode via your phone settings in addition to pairing it in the Fitbit app. Don't get me wrong; I'm very pleased this feature exists. It's just messy. Fitbit has grown its app selection a bit in recent months. It's still nothing compared to Wear OS, but it's better than Samsung's Gear watches. That's sad for Samsung, actually. There are some useful apps like Nest, Hue, Pandora (pre-installed), and the NY Times. It's not a deep bench, though. Watch faces are faring better. Most of them include a ton of data displays for fitness stats, but others are more minimal. You should be able to find something that strikes your fancy. There's a Star Trek LCARS watch face, so I'm all set. My main issue with Fitbit's apps and watch faces is the lack of organization and control. It's hard to find things in the store, and syncing them to the watch takes ages. There does not appear to be any official way to pay for apps or watch faces, so developers have resorted to some ugly kludges to sell items. For example, one watch face directed me to a strange third-party payment site and gave me a PIN code to pay for a license. The Versa collects notifications from your phone, and the location has switched to a swipe down on the watch face rather than up. Otherwise, the situation is almost identical to the Ionic at launch—that means bad. You just get a list of unbundled notifications, most of which don't even expand to show more text. You can't do anything with the notifications other than swipe to clear them, and that doesn't clear them on your phone. Fitbit is working on adding quick replies to message notifications on Android, but that's not live yet. 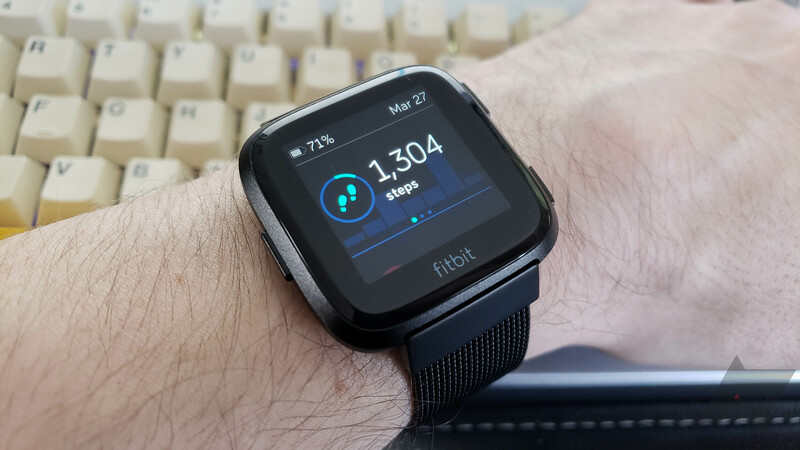 Despite multiple updates and a whole hardware revision, Fitbit's smartwatch software is not reliably able to remain connected to my phone. Even with the always-on connection and all-day sync features enabled, the watch just randomly drops out for an hour or so at a time. Even manually starting a sync job won't always get the connection running again. I've experienced this with multiple phones, too. If there's a bright spot, it's that the Versa can save several days worth of tracking data, so it'll add it to your app whenever it reconnects. I demand certain things from a smartwatch, and the Versa nails a few of them perfectly. It's comfortable and has excellent build quality. The square display is bright and legible, and it looks nicer than the rectangular one on the Ionic. Fitbit's bands are also very attractive, even though they're probably too expensive. The fitness tracking is also fantastic with automatic workout tracking, step counting, and sleep monitoring. While media controls are a pain to set up, they do work, and I'm happy to have them. There are a handful of good apps for the Versa, and there are plenty of watch faces. The battery life is one of my favorite things about this watch. It's nice to be able to wear it for the better part of a week without worrying about the battery level. 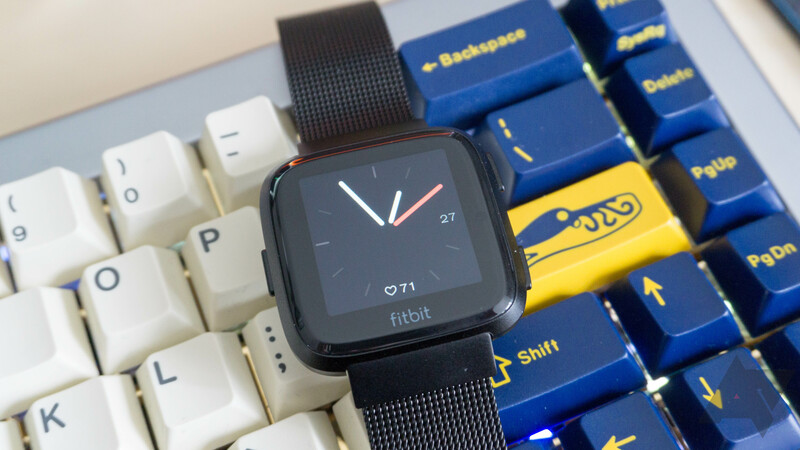 Unfortunately, the Fitbit Versa also has some shortcomings. Notification management is clunky, and the sync connection is unreliable. I wish the watch itself were a bit more snappy, too. Finding and installing apps via the phone takes too long, as well. Then there's the lack of NFC payments on the standard edition watch and GPS on both versions. I suppose you're getting this device for $100 less than the Ionic, so you have to expect some compromises. The Versa is priced well at $200. If you're a Fitbit fan, the Versa will be an easy purchase. It's got all the features you love about your Fitbit with smartwatch stuff on top. 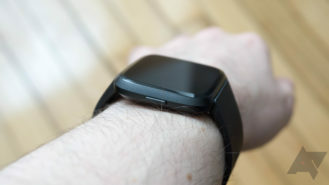 For those looking to get more active, the Versa could also be an ideal wearable. If you're not happy with the high-power smartwatch platforms, you might want to give the Versa a shot for its long battery life. Just be aware of the laggy performance and occasionally spotty connectivity.